Breakfast is my favorite meal of the day. Well, second favorite meal if you count dessert as its own meal, but most people don’t. I’m one of those people who must have breakfast food in the morning and I’ll eat breakfast food for lunch or dinner. So, as you can imagine, I love a good brunch. Brunch is perfection to this night owl; a slow Sunday, time spent with people you love, and lots of amazing food and mimosas (or bloody marys) for breakfast late in the morning – what’s not to love about brunch? Brunch can be tricky, however. Some people prefer a brunch buffet and many do not like buffets. For me, buffet or à la carte doesn’t matter as long as there are bottomless mimosas (champagne or proseco with a splash of orange juice, a splash), but my friends are a mixture of pro-buffet versus pro à la carte (you know who you are, peeps!). When you have a mixture of preferences it makes brunch rather tricky to navigate. Our favorite brunch destination closed forever a few months ago, much to our dismay, and we have been on the hunt for a new favorite brunch location. 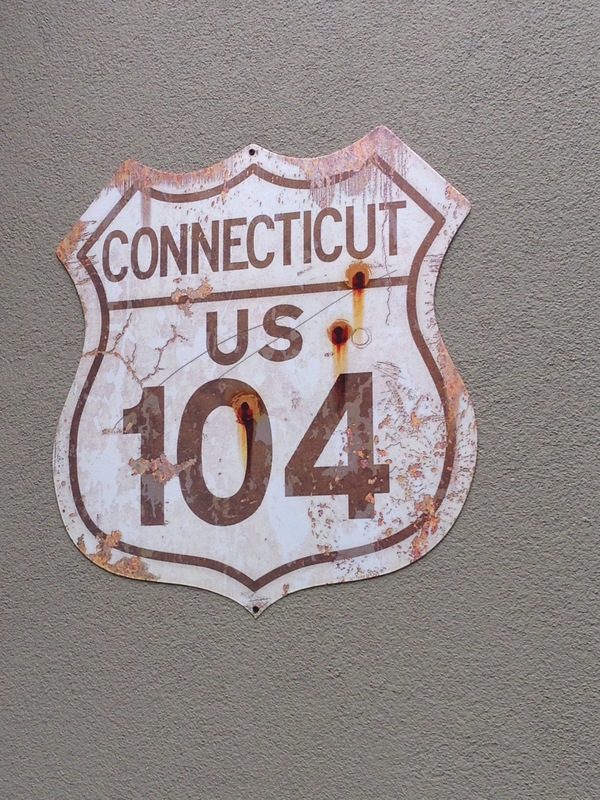 And I’m so excited to share with you that we have found it – one of my top five all-time favorite brunches anywhere (not just in Connecticut) is at Table 104 Osteria & Bar in Stamford. Why is Table 104 such a favorite with me? Why should you go and try it? 1. For $19.95 you can enjoy a two-course brunch, the perfect compromise for the pro-à la carte brunches and the pro-buffet brunchers, or a traditional à la carte menu. 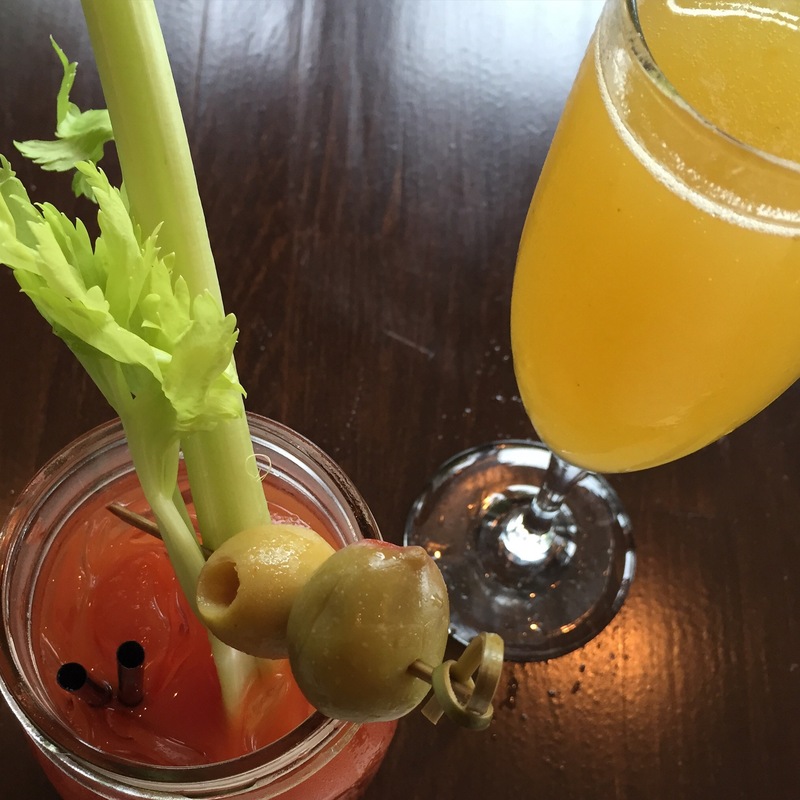 Plus, for an additional $14 you can add bottomless bellinis, mimosas, or bloody marys. 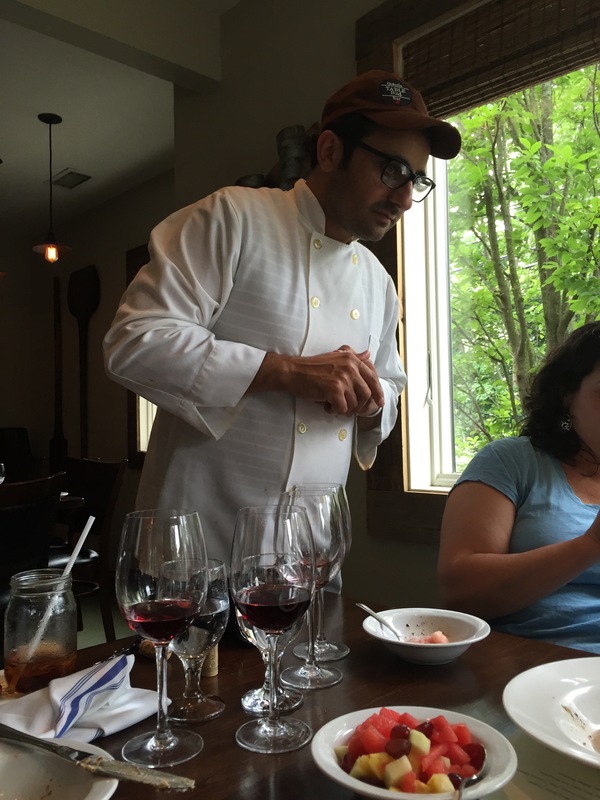 Also, the restaurant has an extensive wine list offering wines from both global and lesser known wine makers. 2. Everything we ate, everything, from the classic Lemon Ricotta Pancakes to the unique 104 Sausage Egg, was so delicious that sharing with the group was a struggle and we all jumped when seconds were brought out for several dishes. 3. 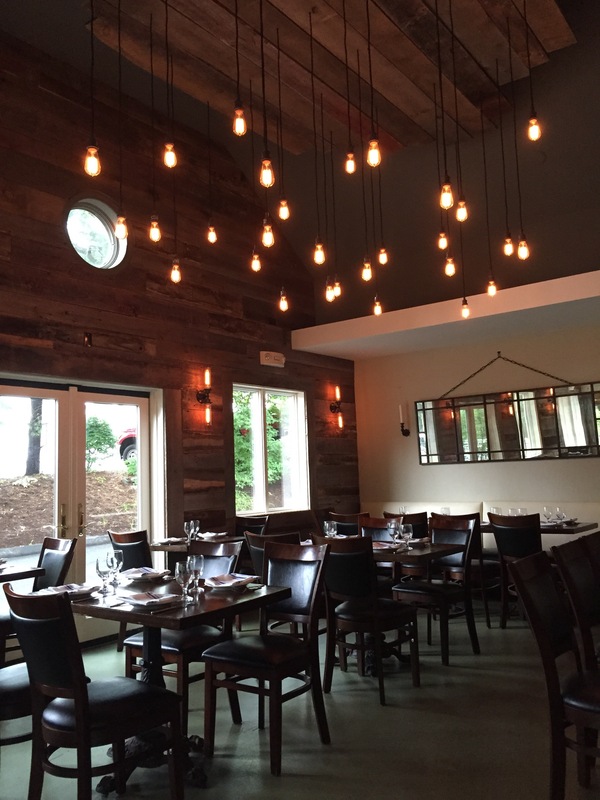 Everyone, from the owner, Walter Cappeli, to Executive Chef Domenico Iovieno to each staff member we interacted with was friendly and offered attentive service within a stylish and casual atmosphere. 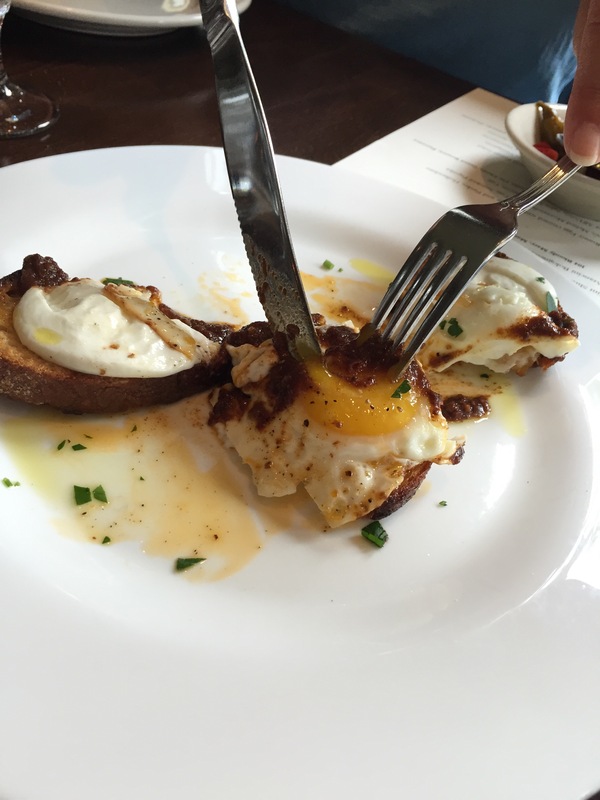 We began our brunch with sampling bellinis, mimosas, and bloody marys and the house-made focaccia bread before beginning with three small plates: Grilled Mint Shrimp, Arancini Bolognese, and 104 Meatballs. The Foccacia bread is made each night after the pizza ovens are turned off so the bread has a softer chewy center and a crusty outside. 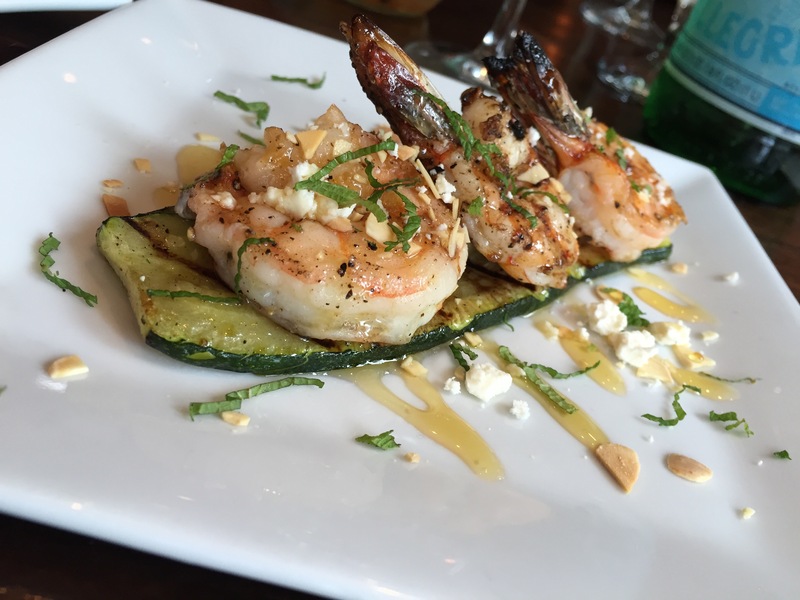 Next up was the the Grilled Mint Shrimp (above). This memorable dish really grabbed my attention because you can taste the flavors of all the ingredients, yet they do not overpower the grilled shrimp itself. 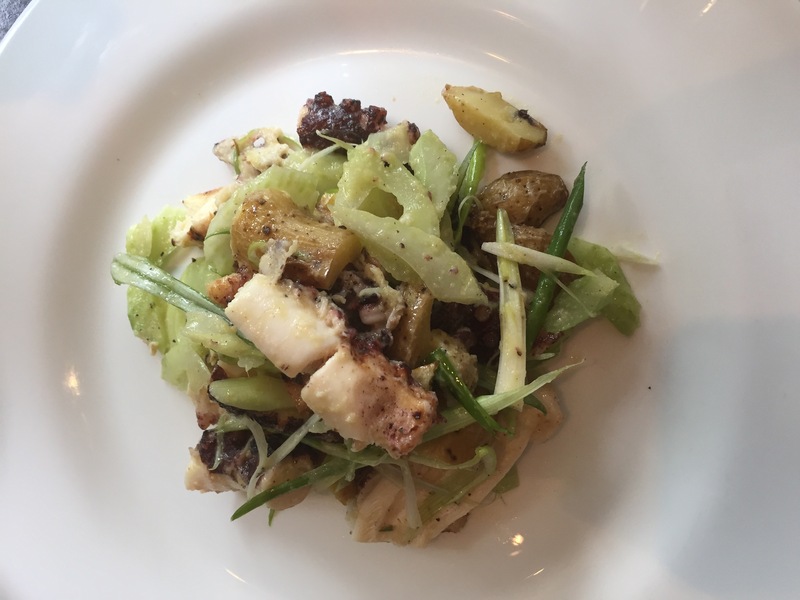 I was pleasantly surprised by the hint of mint and how it complimented the fresh zucchine, the slightly nutty and sweet chestnut honey, feta, and chopped toasted almonds. The Arancini Bolognese followed and were served over the house Bolognese sauce (aka 104 Bolognese). The only down side? 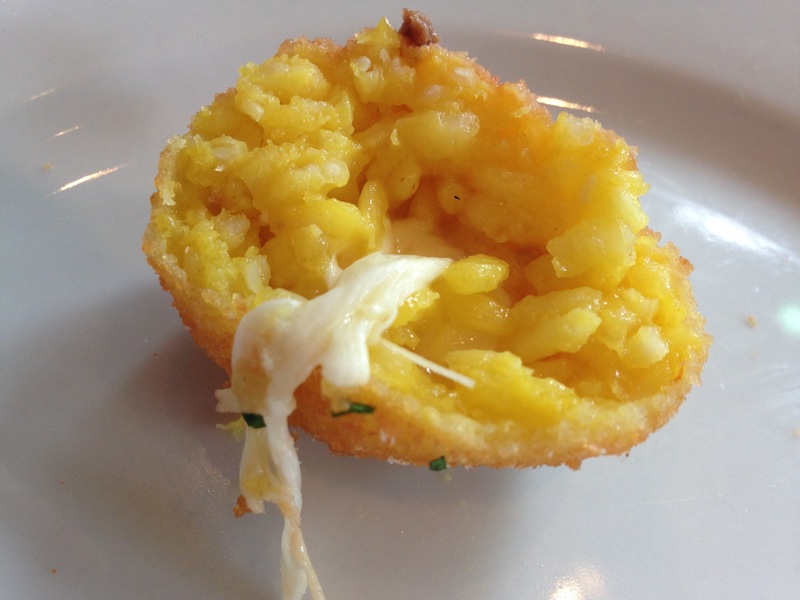 Each order contains only two of these beautiful golf ball-sized fried rice balls. Oh, and did I mention there is cheese in the middle? 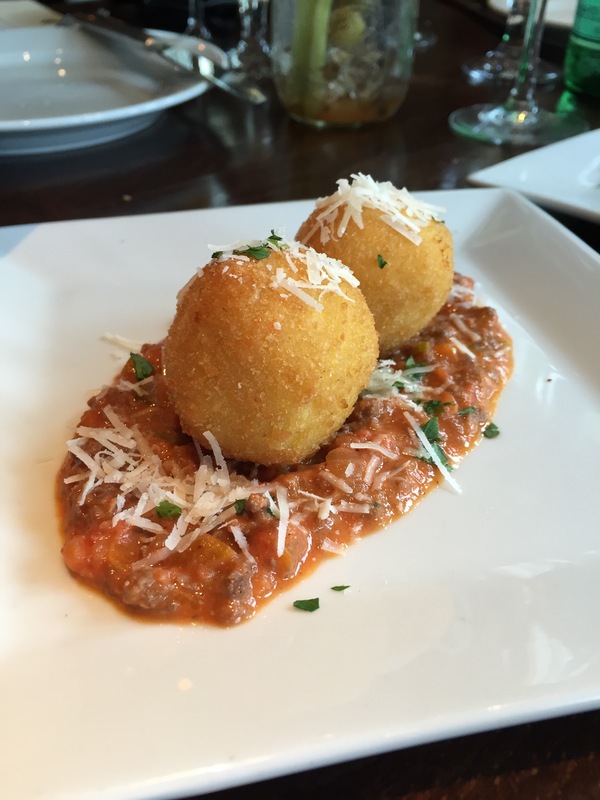 The Bolognese sauce is hearty and adds even more flavor to the Arancini. If you’re looking for a traditional Italian meatball, try the 104 Meatballs at Table 104 served with a rustic tomato sauce and crusty bread. 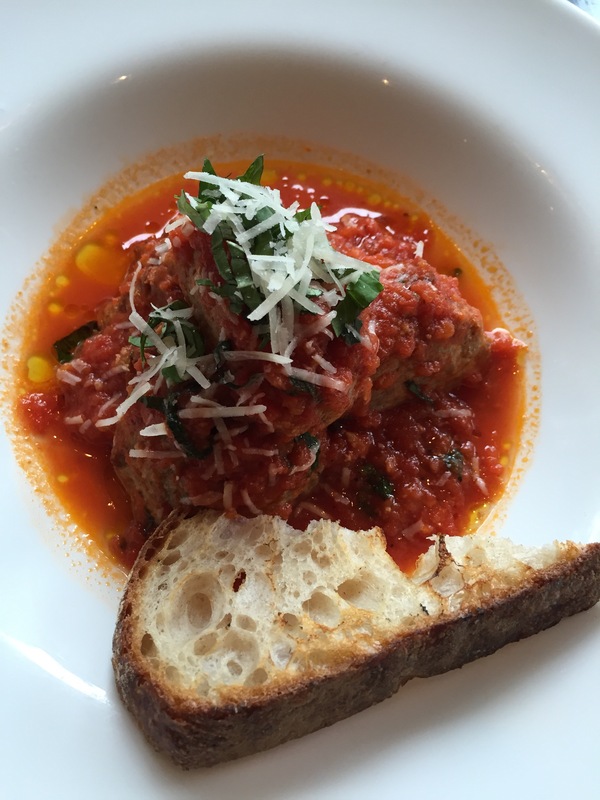 The meatballs are made with a sour dough bread from Brooklyn bakery which is soaked in whole milk and then mixed in with pork, chicken, and beef creating an excellent meatball packed with flavor. If I had to, had to, pick a favorite out of all of these dishes the Buffalo Crostini would be one of my top two. 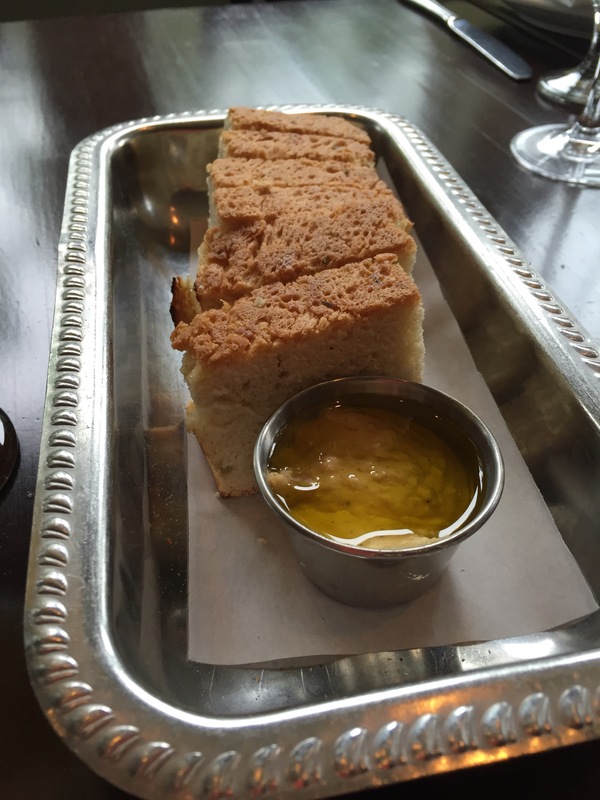 Take a very crusty piece of bread (who doesn’t love crusty bread?) and top it with a melted mozzarella, a fried egg, and smoked paprika – simple yet delicious. Oh hello, beautiful Buffalo Crostini. 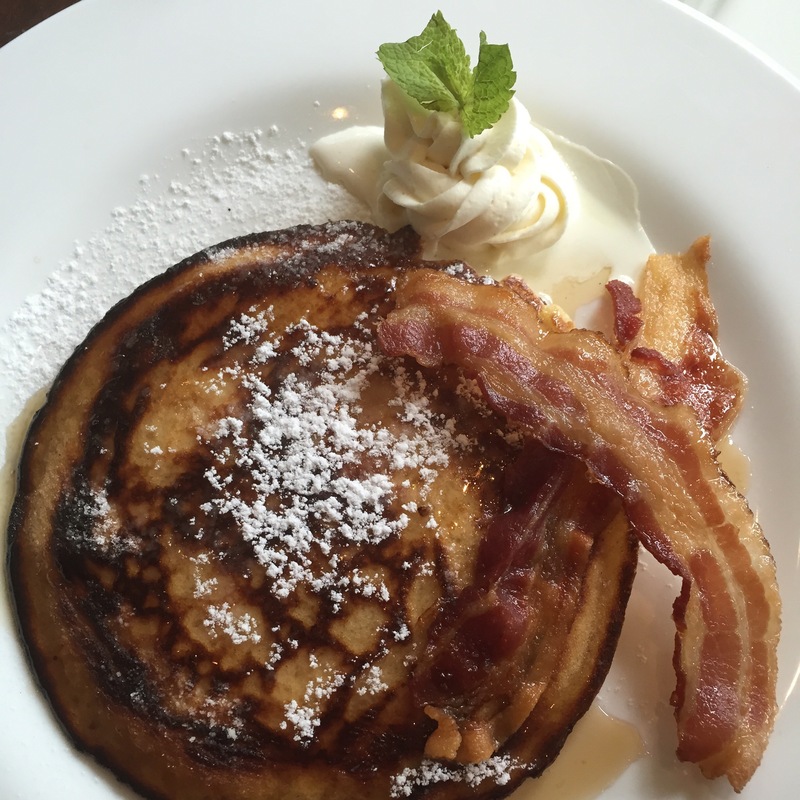 Feeling like something a little different for brunch? 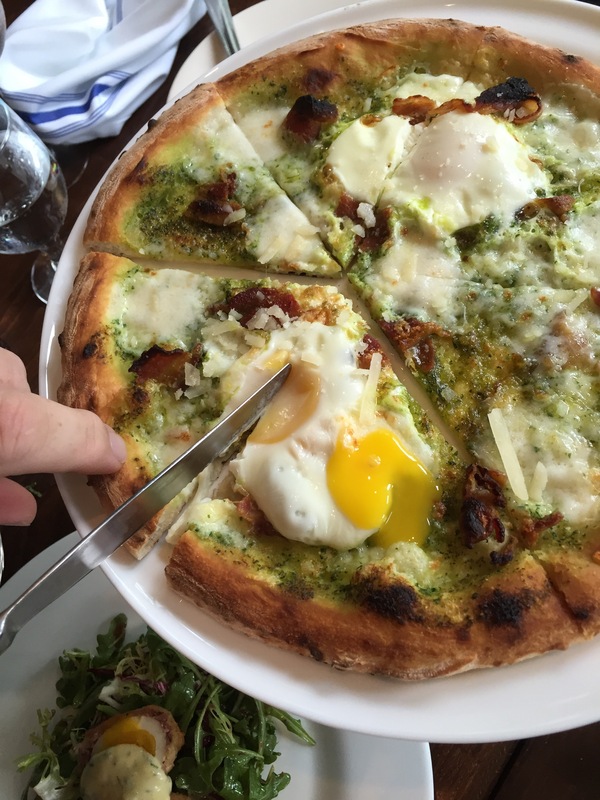 Try the Pizza All’Uovo topped with salsa verde, bacon, and a fried egg. 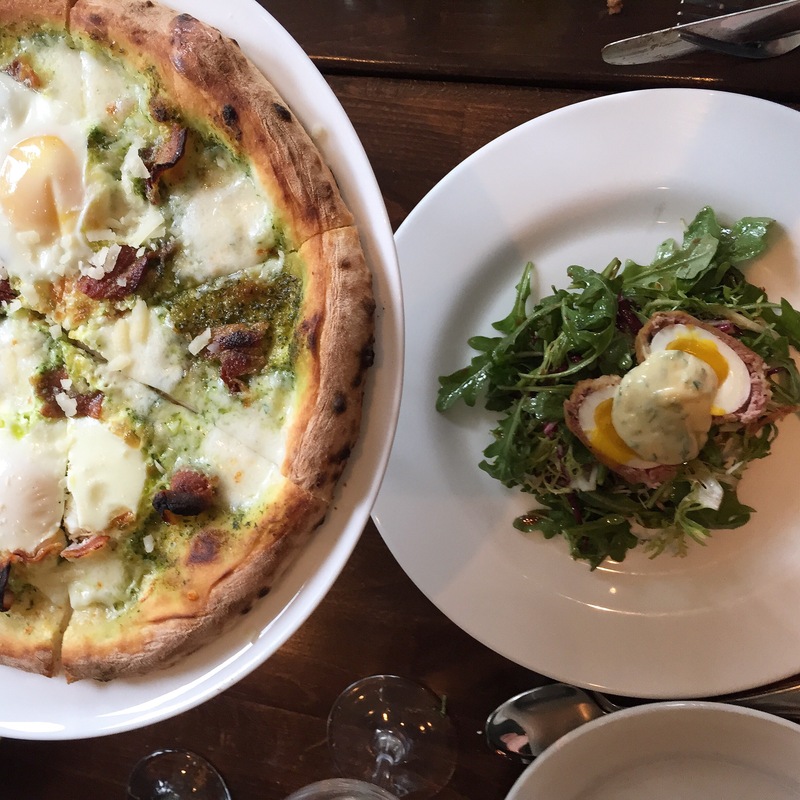 Cooked in Table 104’s wood fired pizza oven, the pizza has a lovely chewy consistency and the runniness of the egg takes the pizza to a new level. Along with the Pizza All’Uovo we tried the very unique, and exceptionally delicious 104 Sausage Egg (also pictured at the top of the post). 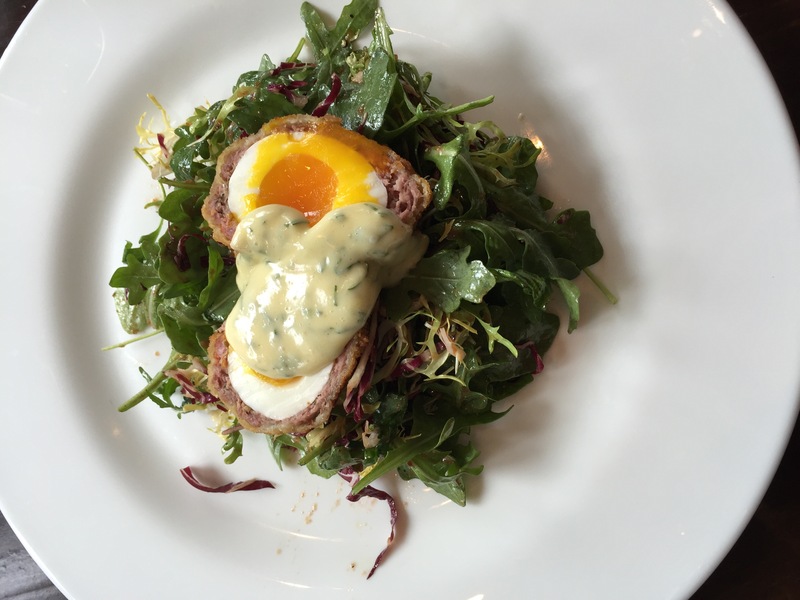 It’s own take on a Scottish Egg, the Table 104 Sausage Egg is a soft boiled egg crusted with panko and sausage – yes, that’s panko and sausage – deep fried, and then served with hollandaise sauce. The panko and sausage creates this beautiful crust that’s is ever so slightly crunchy and packed full of flavor along with the egg itself and the hollandaise sauce. When you visit Table 104 you must try this one! 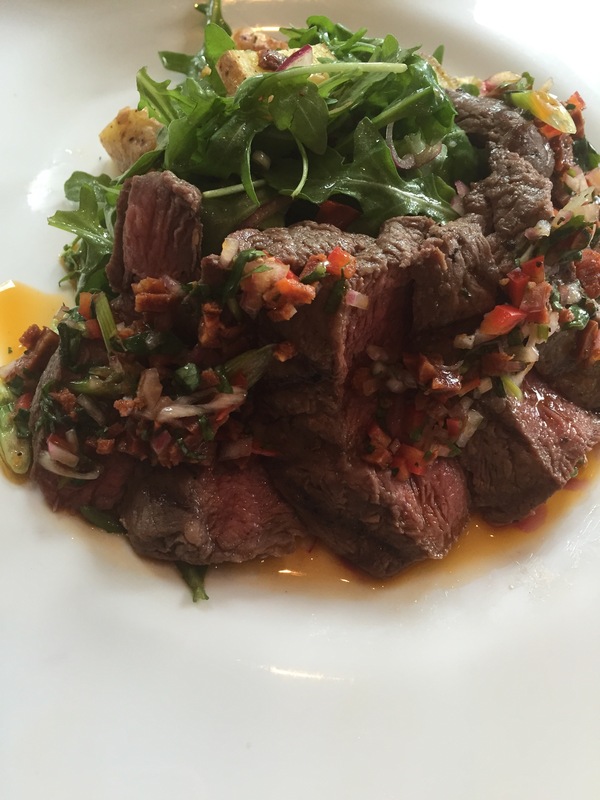 The Flat Iron Steak with smoked chimichurri and a warm potato salad started us off with some entrees followed by Grilled Ocopus (below) with warm potato, chives, celery, with a hint of citrus flavor from the citrus vinaigrette. 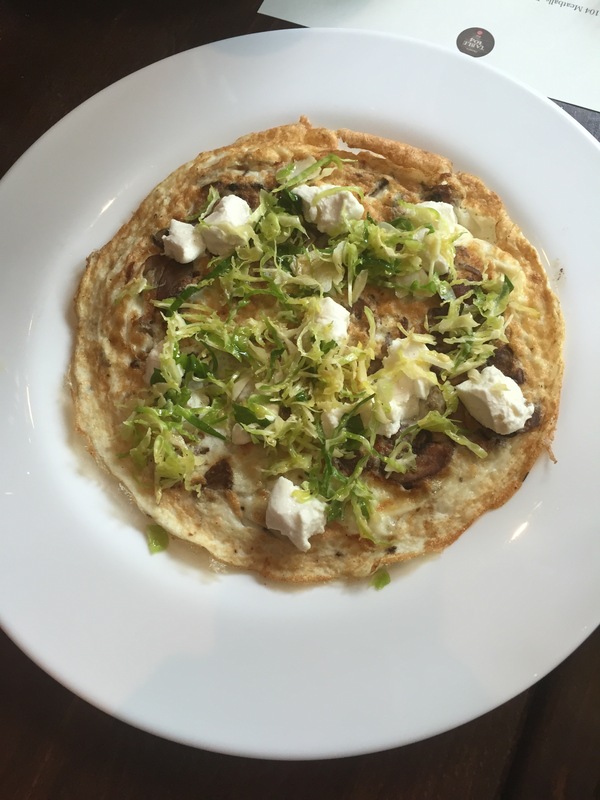 Finally the White Egg Fritatta (pictured above), made with herbed mushrooms, goat cheese and brussels sprouts, and the Lemon Ricotta Pancakes (also pictured above) served with Canadian maple syrup, bacon and a dollop of whipped marscapone finished up our entrees. All four entrees are certainly dishes we would order again upon a return visit to the restaurant. 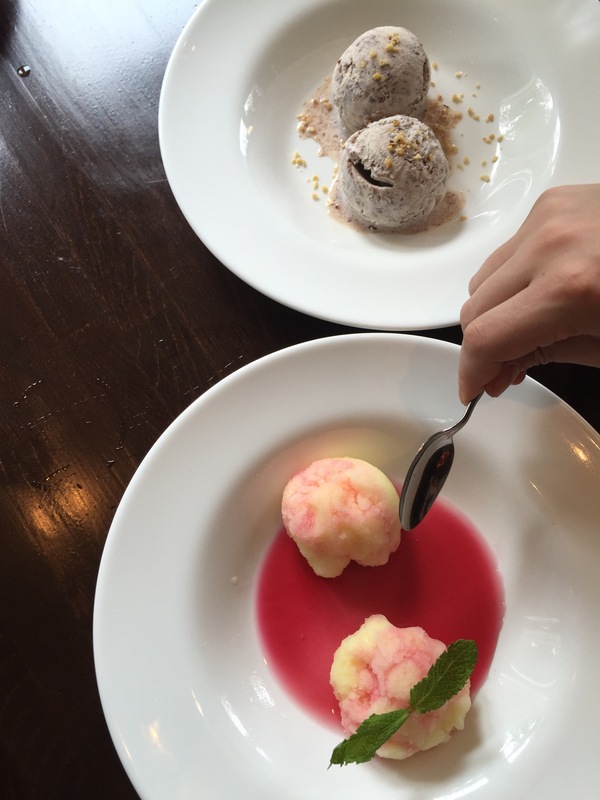 For our final course we were treated to two favors of Artisanal Gelato, a Sorbet, and a Hazelnut Tiramisu. The Sorbet made with clementine grapefruit, cherries, and garnished with mint leaves is light and offers a mixture of some sweetness from the cherries and a little tartness from the grapefruit. The Stracchiatella is a gelato with irregular small shavings or chips of chocolate; creamy and a little chocolatey, this gelato was sweet and delicious. 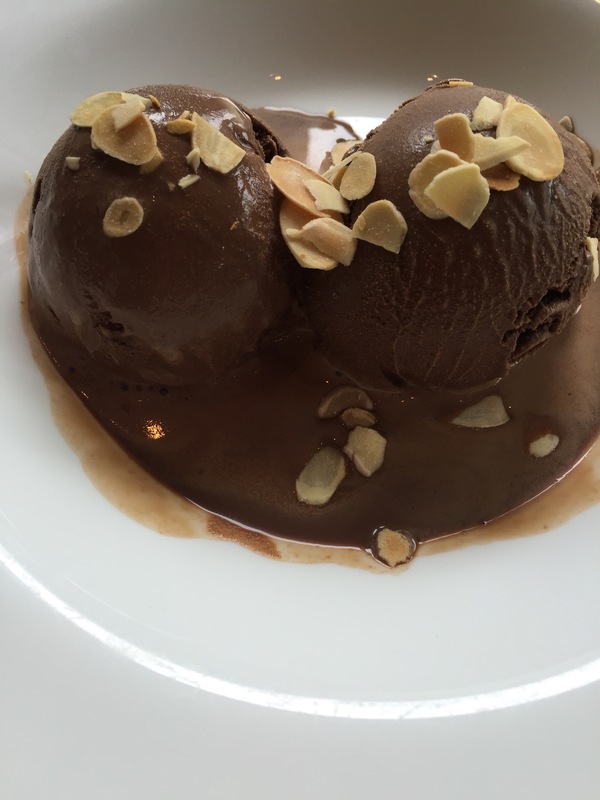 But if you’re looking for even more chocolate, the Choclate Gelato with shaved almonds is what you should order – yum! 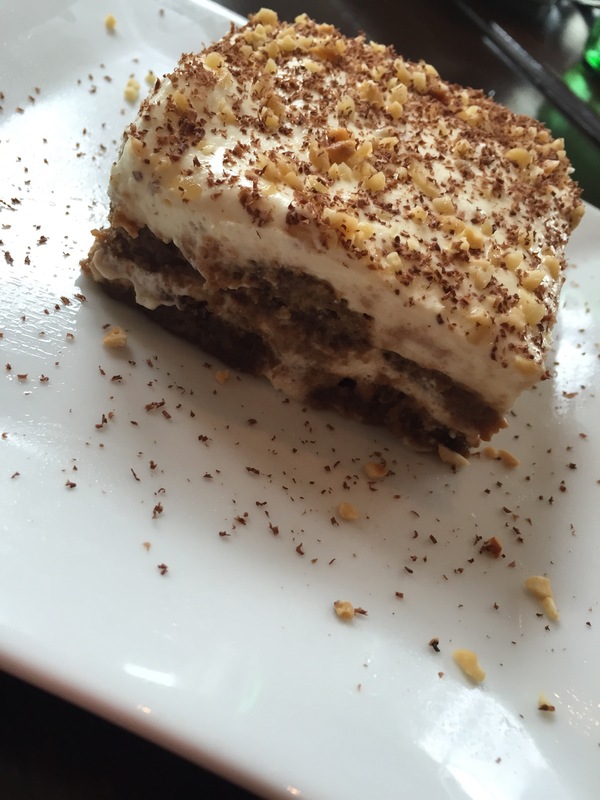 For another traditional Italian dessert option Table 104 offers the Hazelnut Tiramisu made with Bailey’s Irish cream, Frangelico, and dark chocolate. 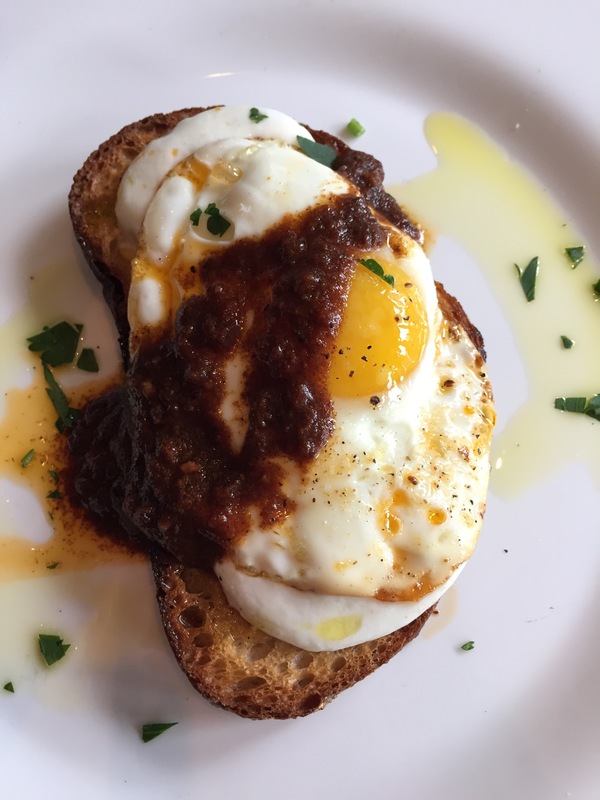 Looking for an amazing brunch that’s sure to please every member of your dining party? 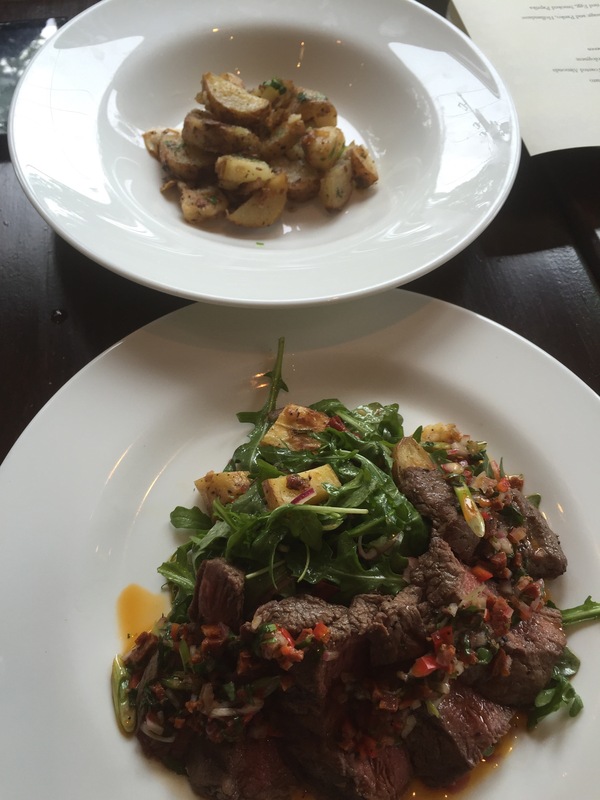 Head over to Table 104 for excellent, high-quality food in a comfortable atmosphere!